When you’re looking for access to top-quality radio frequency plastic welding machines and related products, parts and services, MarkPeri is the comprehensive source your business can count on. We manufacture an impressive range of RF plastic joining equipment representing the cutting edge in the industry. We also provide an extensive inventory of RF welding equipment from other top U.S. brands. You get the selection you want along with customer service and product support dedicated to your complete satisfaction. Since 1981, our in-house team of electrical, mechanical and RF engineers have been using cutting-edge equipment and innovative techniques to advance RF plastic welder technology. With hundreds of machines ranging from 1/2kW to 100kW and combined warehouse space in excess of 40,000 square feet, we offer both turnkey products and tailored solutions based on your specific needs. We have the ability to custom design, modify or adapt radio frequency welders for optimal performance no matter the size of the operation or type of application. Bar Welders — Our MarkPeri bar welders come in 36-inch to 72-inch-wide bar lengths and offer anywhere from 6kW to 20kW power output. Commonly used for sealing long seams found in products such as tarps and liners, our bar RF welding machines for sale feature an exceptionally small footprint, custom mounting of start buttons and a special attachment for punching out grommets for a smoother welding process. Small Footprint RF Machines — When space in your production facility is a concern, no other RF welder manufactured in the U.S. is as compact as our small footprint machines. A powerful 25kW version of our reliable 4kW design, this RF welder for plastic has helped countless businesses in the automotive and medical industries improve productivity no matter the physical constraints. Double Cycle TTBL Machines — Our double cycle RF welding equipment delivers ultimate performance and reliability while eliminating the need for additional processing equipment. With a small footprint, this 10kW generator features a stepper motor-controlled double-cycle switch. You get a durable RF welder for plastic that’s suitable for a wide variety of medical applications. If you’re searching for a more affordable way to buy RF welders, MarkPeri is a full-service supplier capable of rebuilding all types of machines. We offer value in the reconditioned market by delivering quality and selection along with dedicated customer service, product knowledge and support. Our team of experienced technicians take great care in restoring radio frequency welding machines to “like new” condition. All refurbished RF welders for sale come with a six-month factory warranty. MarkPeri is home to the widest range of RF welders for sale for your automotive, industrial or medical applications. We manufacture and sell bar welders, small footprint RF machines and double cycle TTBL machines capable of unlocking the full potential of your operation. 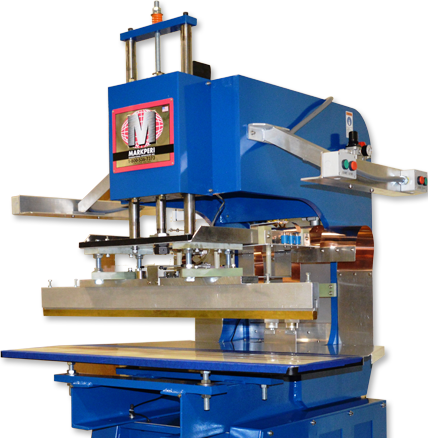 Whether you need a cost-effective used or refurbished option or a custom-configured plastic welding machine, you’ll find it here. Give us a call for more information and to place your order today!